This past May, our development manager, Madi, travelled with a Wine To Water volunteer team to the South Asian country of Nepal. These writings are from Madi’s journal and include her thoughts and reflections on the trip. As soon as we arrived in Kathmandu, Nepal, I instantly noticed a layer of dirt covering the entire surroundings and creating a brown hue that blanketed the city. This layer of pollution, however, contrasted against the colorful saris and clothing people wore. The sound of cars honking and motorcycles revving were unmistakable. Our first project was in Dharmasthali, an hour Northwest of Kathmandu. The school was surrounded by terraced farmland and stood high on the rolling hills. During the earthquake, one of the school buildings collapsed and a few months later, UNICEF had come in and created a small temporary bamboo structure with a tarp for a roof until the school could build another building. They still had a three-story building that withstood the earthquake that they used for classrooms as well. Twenty-five people died from the earthquake in the community. Once the team got there, many of the destroyed houses had already been cleared out. Around a few hundred people used one well in the surrounding area. During the dry season, the water reduces to a drip and families line up to fill their buckets. 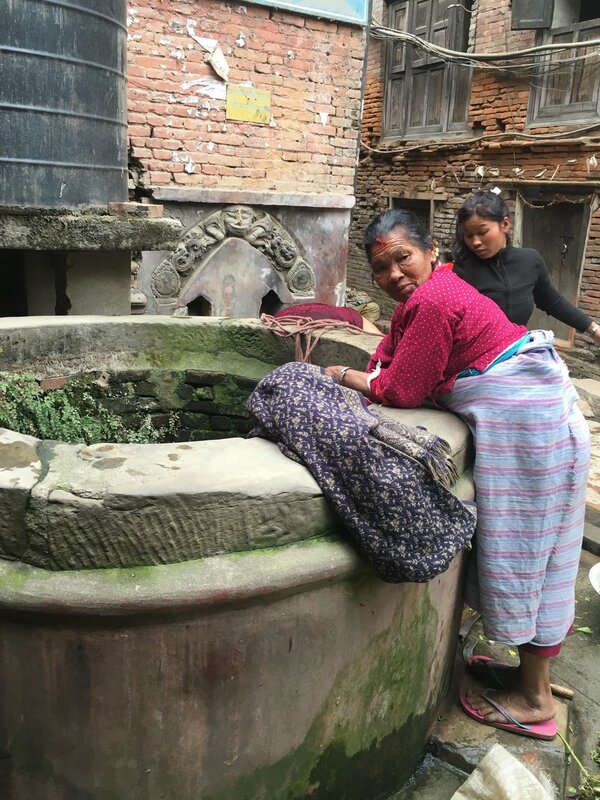 While we were at the well, a woman was washing her clothes and filling up buckets of water. Our National Program Manager, Roshani, explained how many families from the surrounding area come at night when the line isn’t long to get water. Even standing there, at the well, watching the woman wash her clothes, it was almost impossible for me to fathom the huge line of people waiting for water. The school we were working at got their water from a ways away (two hour walk) but their pipe needed to be fixed and reburied. Many children were not showing up to class because they didn’t have proper bathrooms. Once the community’s plumber, Sitiram, located the broken pipe for us, we all got pick-axes and shovels and started digging. We shortly finished burying the pipe and the next two days we worked on the plumbing around the bathroom and creating a handwashing station at one end of the bathroom. We spent our breaks dancing with the kids, learning Nepali handshakes, and teaching them acro yoga. What we did in three days would have taken the community fifteen days to complete. It occurred to me how powerful a team of people can be. When multiple people come together, you can defeat huge tasks in a matter of a couple days. We repainted the bathroom and made everything look new for the inauguration. The day of the inauguration, many of the children’s parents and government officials came to see what had been completed. Once Lisa, our volunteer coordinator, cut the rope, the president of the school turned on the faucet, cupped her hands underneath it, and threw the water out into the crowd spraying everyone with the water. The kids, being slightly soaked, danced and jumped around with us until the teachers called them back to class. With this project, 117 kids received access to water. The next project was at a school in Pharping, which was a few hours south of Kathmandu. The school building was a beautiful three-four story concrete structure overlooking the vast farmland. It was on a steep incline so the building was tiered. We worked with a local water filtration company that used a carbon filter as well as a biosand filter that would filter the water into a reservoir that would then pump the water into the pipes for drinking water. The school had over 700 students who now all have clean drinking water. One profound thing I learned was the overruling nature of the caste system. It separates people and subjects people to a hierarchy of living. It is not fair that once you are born into the Untouchable caste, there is no chance of mobility. Society will see you as the lowest of the low forever. When we went to Gobrani, after our first two projects, to check up on wells WTW had dug in March, the way the untouchables dressed and lived was completely different than the other castes. There are three castes represented in Gobrani and so WTW dug three wells for each caste. We found out that after WTW dug the well for the Untouchables, their previous well broke. If we had not dug the well that we did, the families would have had to walk a mile to get water even though there were two other wells in the community that were being used by other castes. I was amazed at how just a couple blocks away from each other people can live so differently and not associate with each other. One Untouchable woman said to us while we were checking on their well that they would have died if we had not dug the well. A second takeaway from this trip was the importance of monitor and evaluation (M&E). In Gobrani, a well that was dug in March was still pumping out sand to where the families had to put a cloth around the opening to filter out the sediment. If this were to last another month, the well will have to be fixed. We would not have known that if we didn’t check back up on the well. In Padampur, one of the most impoverished villages WTW has probably ever worked in, their well had stopped pumping out water. When we arrived again in their village, the kids remembered and ran to the van to greet us. They even asked where the people were who came in March. It was amazing to see the relationships that had been built between this village and WTW. We tried to fix their well late into the night but did not have success. WTW was planning on going back the next day and it turns out that the community had fixed it themselves. It is a great feeling when nationals are empowered enough to fix their own well. This is transformational! M&E is transformational. It allows real relationships to be built and allows locals to be empowered and feel heard. What is poverty? Poverty is a feeling: a feeling of helplessness and inferiority. Poverty isn’t about the material things that you have or don’t have. It is much deeper than that. 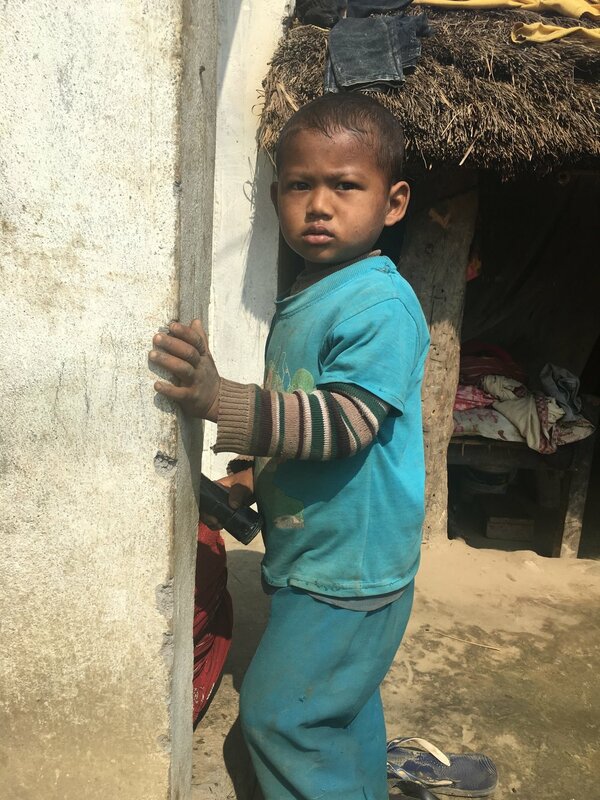 With all of the money that the WTW volunteer team spent to come to the field and serve, Wine To Water Nepal could have supplied 14 ½ sanitation and hygiene stations. So, why come on a volunteer service trip? Why not just send the money for the projects straight to WTW Nepal? This question haunted me throughout the last couple of days of my trip. However, it is not about material things. It’s about the people living in poverty and helping them feel heard and respected and powerful. We are all poor in some regard, whether that be materially poor or spiritually poor, emotionally poor, etc. It’s worth it to come serve in the field because you are giving yourself the opportunity to be heard and to allow others to be heard as well. You are given the opportunity to love complete strangers and help them empower themselves. You get to witness and be a part of something transformational. At the end of the day, it’s not about what you do, it’s about who you impact and the relationships that are transformed. Sometimes you cannot do great things- only small things with great love. It’s not about you. When working as a team of individuals, your efforts are multiplied and big tasks can become simple and easy. With this being said, accept people no matter who they are and whatever you do, love covers all. Namaste.